One of the most important aspects of running a leisure centre is ensuring that patrons are acting in a responsible and alert manner. While that is still the case, the slip-proof flooring solutions that Flowstone delivered will provide Ruthin Leisure Centre patrons with luxury and stress-free usage. Just like the industrial areas we specialise in, hygiene is a top priority. Public areas where people are entering, changing, exercising and leaving need to have flooring of the highest quality. Ruthin Leisure Centre now has a flooring system that not only leaves no spaces for bacteria to gestate, but is also designed for easy and thorough cleaning. We delivered on this by installing our seamless Virtus 4mm Epoxy Quartz flooring system and we smashed those targets right out of the park. 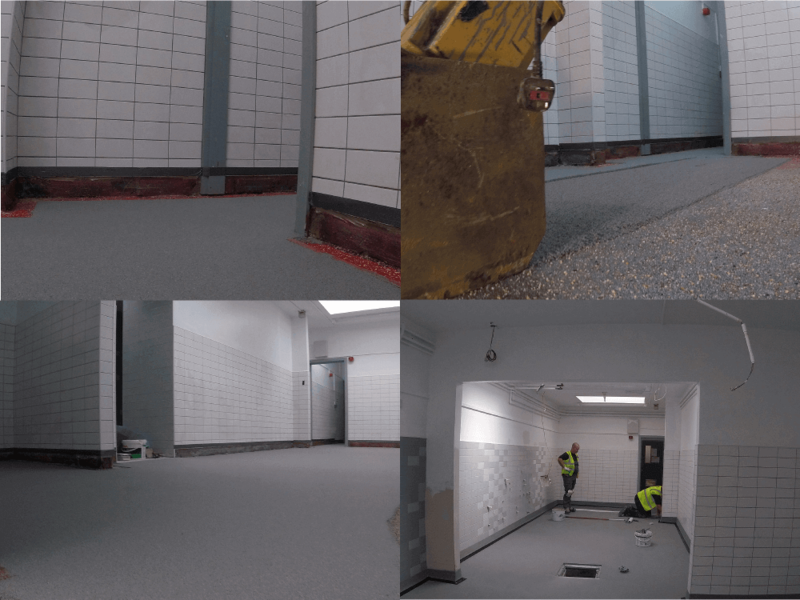 Here we are applying the first stages of our Epoxy Quartz, having mechanically prepared the entire changing room area. Our experienced installers fully clean and key the substrate, carefully lay an initial seal, finally applying a thicker coat of Epoxy. Our installers are careful to level out the floor in an intuitive and customer friendly way. We created gradual slopes which run towards the newly-installed manholes, directing water towards the drains and preventing pooling. Ruthin Leisure Centre were thrilled with their brand new, resistant, non-slip, easy to clean floor. Within a matter of hours Ruthin was ready to open their doors and “wow” the general public with a new look and a cleaner, safer space. So, if you have a project in an area that is likely to experience a high level of wet foot traffic, call us on 01978 790 186! You can also get in touch via our contact page.